Credit: sdecoret/Shutterstock, Baldrige Performance Excellence Program. 2017. 2017–2018 Baldrige Excellence Framework. In this blog series, we are highlighting some of the learning (successful strategies and programs) shared by Baldrige Award recipients to highlight the categories of the Baldrige Criteria and how your organization might consider using them as guidance. Part of the purpose of Malcolm Baldrige National Quality Improvement Act of 1987 (Public Law 100-107) is to disseminate information about the successful strategies and programs of Baldrige Award-winning organizations that “practice effective quality management and as a result make significant improvements in the quality of their goods and services.” Such sharing by Baldrige Award recipients is done face-to-face and with the option of asking questions of and networking with these recipients at the Annual Quest for Excellence® Conference, as well as at the Baldrige Fall Conference. Baldrige Award recipients also often host sharing days after their wins to share best practices. Category 6 of the Baldrige Criteria covers your organizations operations. Credit: Baldrige Performance Excellence Program. 2017. 2017–2018 Baldrige Excellence Framework. The Operations category asks how your organization designs, manages, improves, and innovates its products and work processes and improves operational effectiveness to deliver customer value and achieve ongoing organizational success. The management of your key products, your key work processes, and innovation can create value for your customers and help you achieve current and future organizational success. In addition, how you ensure effective operations can lead to a safe workplace and patient and student environment. Effective operations frequently depend on controlling the overall costs of your operations and maintaining the reliability, security, and cybersecurity of your information systems. Following are some practices shared by Baldrige Award recipients (Momentum Group, MidwayUSA, and Adventist Health Castle) in the realms of quality improvement, process management/performance, supply chain management, and patient-focused delivery of health care. What could your organization learn/adapt? Momentum Group is a recognized leader in the commercial interiors industry, creating exclusive, design-focused fabrics for customers that include architectural and design firms, and commercial furniture manufacturers. 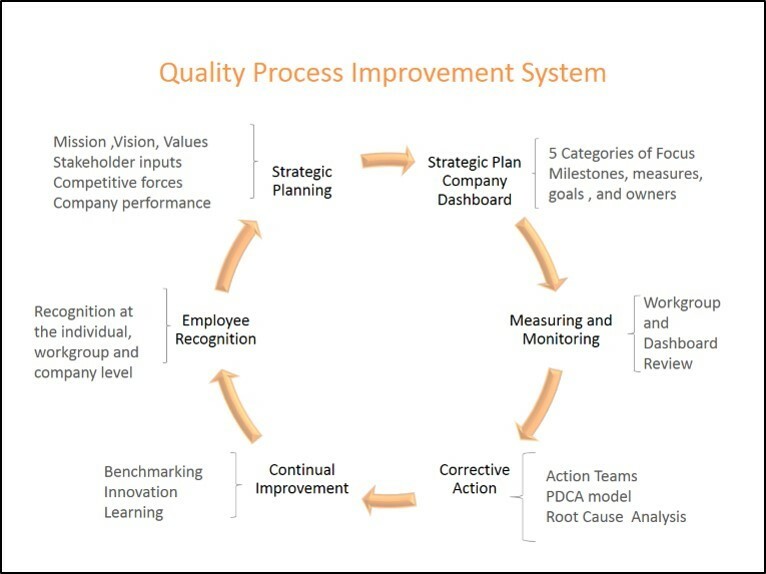 One of its successful programs is its Quality Process Improvement System, which is used as a consistent operating path for initiatives, such as forming a quality leadership team, developing problem solving groups, providing all employees with quality training, and benchmarking and implementing a best-in-class recognition program. The system has led to investments in process upgrades that have reduced sample production time by 50 percent and improved sample yield per yard by 20 percent. Additionally, Momentum Group identifies six core processes and five support processes and has adapted the Baldrige Criteria to what would work internally for the organization. An annual Baldrige-based self-assessment process is used by all 11 core and support workgroups. Following a prescribed format used for the past 16 years, Momentum Group has each assessment externally reviewed. MidwayUSA, an Internet retailer offering "Just About Everything"® for shooting, hunting, and the outdoors, uses the questions of Baldrige Criteria category 6 to guide its goals of delivering stakeholder key requirements, improving proactively, understanding process interactions, becoming sustainable, and managing for innovation. A key area in category 6 is supply-chain management. 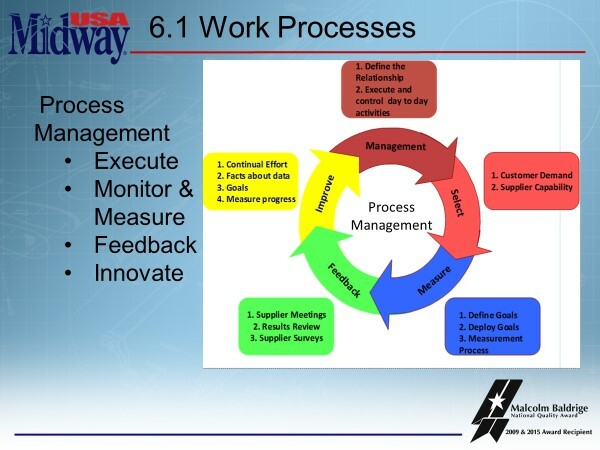 For MidwayUSA, highly effective supply chain management (see image 6.1 Work Processes for the steps and feedback look that the organization follows) has resulted in a nearly 83 percent in-stock product rate, which is difficult to achieve in MidwayUSA's industry. It has also resulted in an increase in inventory turns (the number of times inventory is "turned over" as measured by the cost of goods sold divided by the average inventory) from 5.2 in 2004 to 7.8 in 2015. Process management has helped MidwayUSA maintain a satisfaction rate for its suppliers and partners at or near 94 percent each year from 2008 to 2015, a rate better than the 84 percent achieved by the company's number one industry competitor. 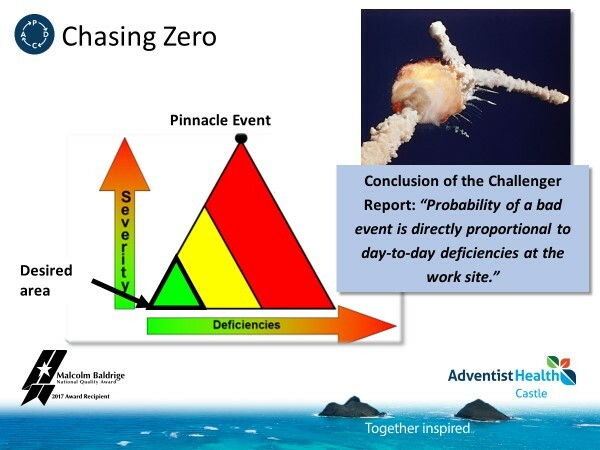 Adventist Health Castle is a community hospital system that provides inpatient and outpatient care to people who primarily live on the windward side of the Hawaiian island of O’ahu. It is one of 20 hospitals within the nonprofit, faith-based, Adventist Health system headquartered in Roseville, CA. Adventist Health Castle sets service and process requirements at top decile whenever benchmarks are available. 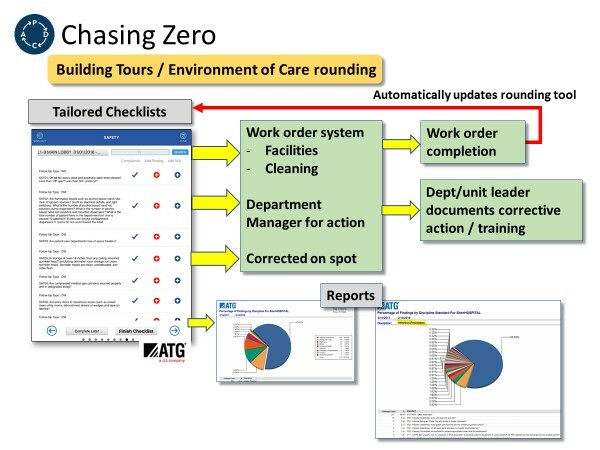 This has led to a pursuit of quality improvement for the benefit of its customers, “chasing zero” harm to its patients. As a result, it boasts rates from below 1 percent to zero for common hospital-acquired infections (i.e., catheter-associated urinary tract infection [CAUTI], central line-associated bloodstream infection [CLABSI], surgical site infections [SSI], and Clostridium difficile bacterial infections), as well as patient falls. Adventist Health Castle has been a top performer nationally for having had zero CAUTI infections in its inpatient units for the last 3 years and 5 months. Adventist Health Castle’s ICU is performing in the top 10 percent of ICUs nationwide, with a CLABSI rate of zero for four of the last five years. The hospital addresses safety through its Environment of Care Committee, Patient Safety Council, daily Safety Huddle, associate education, and inte­grated patient care. For a safe environment, it prioritizes patient safety, regulatory requirements, cost, relationship to its mission/vision/values, and the importance to customers. The Chasing Zero images show some of the steps it takes to ensure safety. Dawn, thank you for presenting results data for the selected processes. This link is central -- literally - to the Baldrige Excellence Framework and explains an most important part of the concept of "integration."